Skylines are indeed amazing views. They depend on the structures on the ground and what the sky looks like at any given time. Skyline prints can be used in any room with amiable results. "Los Angeles" is one example that shows how amazing these images can be. Comparing the images, they have different color shades and content. That means for whichever place you want to have the skyline art, there is always a fitting image for you. These images are also provided for you in diverse sizes. You can therefore work with them to make your interior look much better. 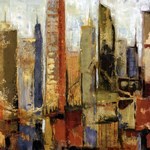 There are however factors to consider when picking skyline pictures for any room or place. The color of the background, the intended mood, and the items in the room are some of the things that must be considered in order to have an all round attractive interior. We’ve made it possible for our customers to get the best of results with their selection of skyline images. These have been provided to ensure that you get the most personalized result for every space you want. For example, if you select "A Urban Skyline Brilliantly Lit Up In The Evening," you can have it printed on a dark canvas and hanged on a wall that has lighter and a neutral color shade. Besides printing your skyline photos on canvas, you can also have them framed using a frame with a color that matches properly with your furniture and the other design accessories. The other option that you can explore is lamination. This is an option that protects the artwork from things like fingerprints and liquid spills that may end up causing damage to the artworks.